Do not pass? Go? Do not collect $200? On my morning commute to work, I travel along a five-lane highway (two lanes in each direction, plus a shared turn lane). There is a bus stop in front of a large apartment complex, and the bus picks up a huge bunch of kids there. Every morning, this south-bound bus stops in front of the apartment complex, and several dozen kids get on, taking their sweet time (as kids do). All of the south-bound cars are blocked while the bus is stopped. At this time, I am usually wondering why that bus does not pull into the apartment complex’s driveway. After all, they are blocking a major roadway during a busy morning commute time. But it gets worse… not only are all of the SOUTH-bound cars stopped. But the NORTH-bound cars are stopped as well! North Carolina law does not require the drivers in the opposing lane to stop. But most drivers are not that familiar with the details of the traffic laws. And I suppose that when faced with this choice — either err on the side of stopping when not necessary, or err on the side of passing a stopped school bus — most people would take the more conservative option. The North Carolina Driver’s Handbook can be downloaded from the DMV’s web site. 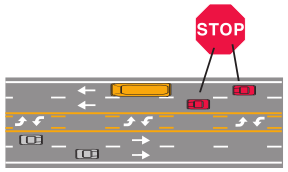 Roadway of four lanes or more with a center turning lane: When school bus stops for passengers, only traffic following the bus must stop. Children waiting for the bus or leaving the bus might dart out into traffic. Even when the school bus is not in sight, children at a bus stop sometimes will run into the street unexpectedly. Always be careful around school buses and school bus stops. So, as always, common sense does apply. I have considered what I might do if I happened to be the first north-bound car to approach as that school bus stopped in the south-bound lane. Would I keep going (with caution, of course)? Or would I stop, just because my fellow citizens might sneer at me for “breaking the law” and for driving with a reckless disregard for out children’s safety? How would a police officer react if he were driving right behind me? I am not saying that stopping for the bus is a bad thing. But I am amused to see how people react when the rules are ambiguous, or when they are incompatible with what seems like a universal blanket rule (Thou shalt stop). Would you want to be the one who follows the letter of the law, but who appears to be a scofflaw?